PGM Žalec is known as a reliable and trustworthy partner in the field of construction material production, as well as manufacturing and service activities. With experience, tradition, and maturity, but also youthful ambitiousness, we can handle all challenges. We are distinguished by quick adaptability, responsiveness, respect of agreements, and ensuring the highest level of services, which our clients especially appreciate and happily return to us again and again for numerous years. Our development, upgrades of the comprehensive offer, and growth in all areas, are guided by a clear vision, directed towards a careful planning of future steps and well thought out steps towards new opportunities. In »Production of construction material Žalec« (PGM) we are aware that the basis of each performed works is previously implemented project, in which many hours of study and planning are invested. Therefore, to a large extent we cooperate and work hand in hand with a number of designers at home and abroad in the early stages of the project design. 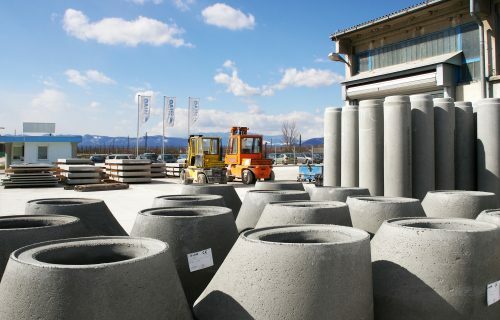 With many materials prepared, oo the technical properties of concrete and reinforced-concrete products, we intend to facilitate the work of designers, with precast solutions as well for workers in a construction phase of the project. Thus, in cooperation with the German company we ahve developed a program EasyPipe *, which allows us static calculations for pipes, with Slovenian companies we have developed a detailed program for drawing shafts, which allows us to quickly and accurately design variant of the shaft and the designers get already plotted detail of the shaft. From our rich treasury of different solutions and information in the field of sewage systems, we have prepared a database for designers, which they can use in their projects and revise them as necessary. In addition, we have developed guidelines for the construction and installation of precast concrete and reinforced concrete products and installation instructions for shafts and pipes, including maintenance instructions. In case you will need a different solution, which is not a standard one or you will need any other detail or calculation, our experts are available to you and will be happy to advise and assist. I agree that the data submitted may be used for marketing purposes. The data is kept in accordance with the law (GDPR).